CUT, an exceptional, upscale steakhouse, offers unique beef (including Japanese Wagyu) and an abundance of wine choices for your dining pleasure. 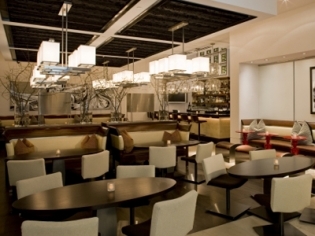 Whether you choose to dine in the restaurant or take a lighter meal in the energetic, adjacent bar Rough Cuts, you will be rewarded with mouth-watering superb entrées created by Chef Wolfgang Puck. Signature dishes, homemade sauces and magnificent accompaniments delight the most critical steak connoisseurs. CUT should be included on your itinerary with each trip to Vegas. A super-chic steakhouse with a contemporary twist, CUT is one of the premier restaurants on the Vegas landscape. Make a reservation now! Amazing experience. The service is second to non. I’ve been to a few nice restaurants and this one is by far the best experience I’ve had. I didn’t feel uncomfortable eating my dinner or sharing laughs at the table compared to other establishments I’ve been to. I would recommend this restaurant to everyone. One of the best steaks I’ve had. The service here was fantastic. The food was delicious. Although in my boyfriend’s opinion, he could cook a better steak(he’s an okie) would recommend if you’re prepared to throw down.